Fun Reading: Narziß und Goldmund by Herman Hesse. I have had this book for at least five years, and I’ve tried (and failed) to read it at least five times. It starts with a sentence that takes up most of the first page. That awful German language indeed, Mr. Twain. Soul Reading: Wealth, Poverty, and Human Destiny, ed. Doug Bandow and David L. Schindler. A priestly friend of mine (no, seriously, he’s a priest) gave me this probably ten years ago, and I’m going to give it another try. Looks like it starts off with a bunch of economic liberals spouting off about the glories of capitalism, and then responses to the same. We’ll see how serious those responses actually are. Theory Reading: Das Kapital I. Yup, still at it. As a matter of fact, I’m exactly where I was when I posted on this a few months ago. Sigh. Dissertation Reading: I don’t have anything right now, but I really need something on colonialism. Suggestions? 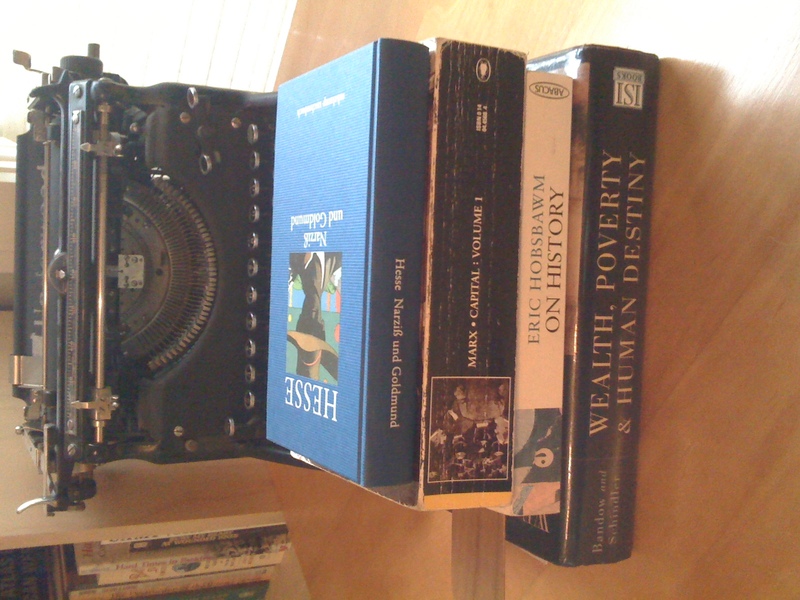 How-We-Do Reading: On History by Eric Hobsbawm. A collection of essays by the master himself. I bought this book eleven years ago while I was living in Berlin. I found myself in an English-language bookstore for the first time in months, and I went on a spending spree, including this text. Never read it. As a matter of fact, I think I’ve only touched it to put it in boxes for moves. I figure it’s been it at least six different houses/apartments. About time that I opened up the cover.